Kyla Ross, 22 scored 3 perfect 10's in the championship finals. 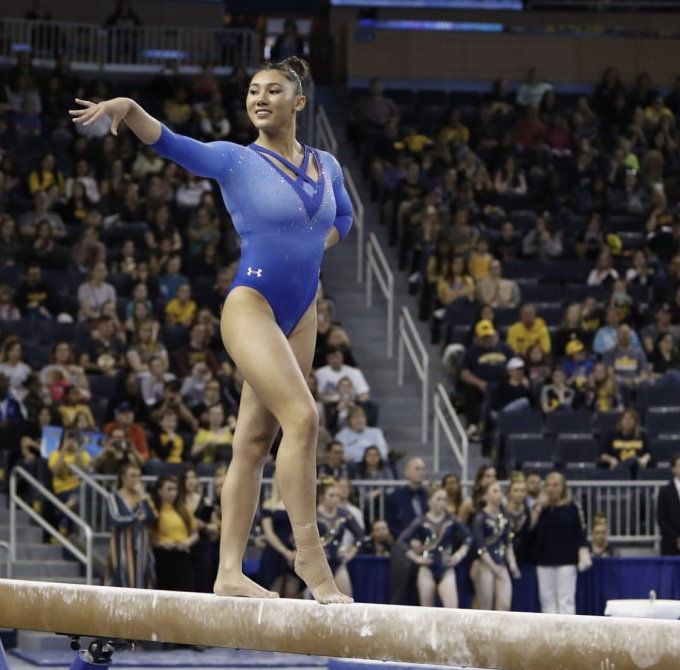 ANN ARBOR, MI—The UCLA Gymnastics team scored 198.975 No. 2 (9-1) and finished first place at the NCAA Regionals on Saturday, April 6. Kyla Ross, 22, scored 3 perfect 10’s. She is the first person in NCAA history to complete two ‘gym slams’ in one season. The team will compete in defense for the NCAA Championship on April 19 and April 20 in Forth Worth, Texas. “This was really good for them, everyone knows mind over matter, and as we go to national championships, they know that they can do this. The whole weekend was really great for their morale,” said coach Valorie Kondos Field during a press conference. “It was exactly the type of meet you want to have before going to the next two rounds,” Kondos added. Ross, a 5 foot and 7 inch junior helped the team advancement in the finals on Friday, April 5 winning 18 perfect 10 scores setting the standards in the final scores ranking UCLA No. 1 in gymnastics. Sophomore Pauline Tratz and junior Gracie Kramer performed along with Nebraska’s Sienna Crouse. Senior Katelyn Ohashi, 21, earned six 10s on the floor exercise. Ross earned 11 perfect 10s, including a “Glam Slam,” and a 10 on the floor during each rotation performance using bars and the vault beam. The NCAA Championship competition begin with two sessions of four teams in the regional semifinal April 5. The Bruins has been awarded one perfect 10 in two meets this season, with 21 perfect scores this season. They have scored more 10s than any team who has competed in the NCAA gymnastics championship.